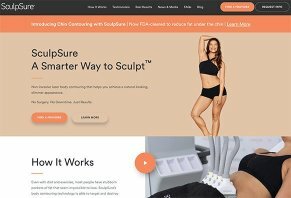 SculpSure Reviews - Lose Weight With Body Contouring? During each 25-minute SculpSure session, the system will deliver light at 160 nm wavelengths to destroy fat cells and address problem areas, without any pain or downtime. Developed by Cynosure, Inc., SculpSure is a non-invasive, FDA-cleared body contouring system that uses lasers and targeted cooling to reduce stubborn fat cells in the belly, love handles, back, and thighs, as well as under the chin. Together, the company advertises that over the course of several customizable 25-minute sessions, it can help you achieve a natural looking, slimmer appearance, without worrying about surgery or downtime. Which is among just a few of the reasons we’re told that more than 90% of patients are satisfied with their results. Most of us have stubborn pockets of fat on our body that never seems to respond to exercise or dieting. But is SculpSure necessarily your most cost-effective solution for addressing them? Let’s help you find answers to your most important questions by starting with the system’s basics. Before beginning your treatment, you and your provider will discuss any areas of concern. Then, they’ll develop a long-range plan to help you achieve the desired results. Next, they’ll evaluate your areas and mark treatment spots with a special pencil. If you’re receiving a chin treatment, you’ll need to shave any facial hair beforehand, and you’ll be provided with eyewear and a disposable cap for your hair while in office. Then, the provider will place the frame on top of your head and adjust it accordingly. If you’re getting an abdominal (belly, love handles, back) or thigh treatment, they’ll place a different frame over the specific area, which affixes in place using an elastic band. 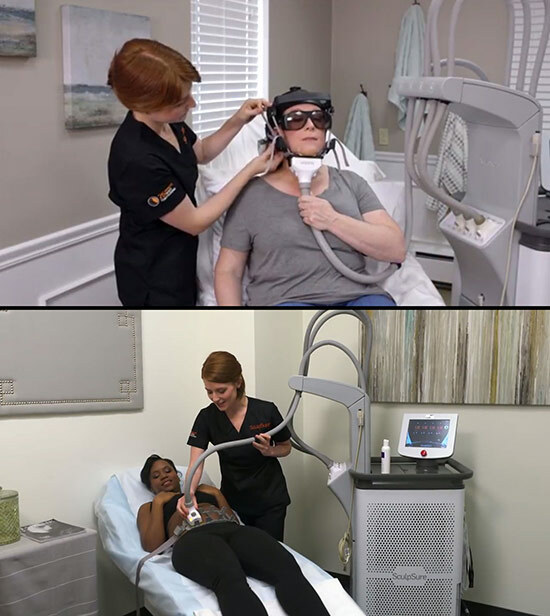 Depending on the application area, your SculpSure provider will attach a series of applicators to different frames, which generate heat and destroy fat cells underneath the skin’s surface. Credit: Cynosure Inc. Inside each of these frames, your provider will attach a series of flat, non-suction applicators, which deliver a specific wavelength of light (160 nm) to fat cells (formally called adipose tissue) via a proprietary modulation method. The SculpSure website explains that you will initially feel a cooling sensation, followed by an intermittent “deep warmth and/or tingling sensation” as the laser cycles on and off. This process raises each cell’s temperature to between 42° and 47°C (about 107° and 116°F), which damages their structural integrity. Despite this heat, SculpSure’s continuous contact cooling keeps the skin safe throughout each treatment. This damage causes cells to malfunction and die off, which are naturally eliminated through the body’s lymphatic system over the course of the next three months. We’re told they will not regenerate. After the 25-minute treatment is finished, your provider will clean you up, and you're free to resume your normal, everyday activities since there’s no post-treatment downtime. While every patient is different, the SculpSure website tells us that some patients report visible results in as little as six weeks with the FDA cleared system, while optimal results usually manifest in as little as 12 weeks. A 2017 study that found the 160 nm wavelength of light effectively reduced average fat thickness between 14% and 18%, and average fat volume between 21% and 24%. A 2018 study indicating that a 1,060-nm diode laser treatment effectively reduced fat in the flank, with 96% of subjects reporting satisfactory results. Another 2018 study, this time indicating that a 1,060-nm diode laser treatment was effective for reducing abdomen fat. Will SculpSure Cause Any Side Effects? According to the system’s website, most patients report feeling an intermittent sensation of deep warmth and/or tingling throughout the treatment, which is generally well tolerated. However, this rarely causes enough discomfort to warrant any kind of anesthesia or ongoing side effects. The amount you pay for your SculpSure treatments can vary widely, depending on high-level factors like the area where you live, the area of your body you’d like to address, as well as the total number of treatments recommended by your provider. With these essential details in mind, most patients on RealSelf.com reported prices between $1,000 and $1,500, although some neared the $5K mark. Overall, the average was about $2,200. To find out exactly how much you can expect to pay, be sure to visit the Find a Provider section of the SculpSure website. What Kinds of Results are SculpSure Customers Reporting in Their Reviews? On RealSelf.com, 85% stated that they would recommend SculpSure, with common compliments citing its effectiveness at reducing the appearance of fat in stubborn areas, as well as results within just a few weeks. In fact, many reported results in as little as two treatments. On the other hand, most complaints seemed related to ineffectiveness in achieving the results they were expecting, as well as pain during treatment (most often referencing stomach procedures). More than one also reported slight tenderness and soreness the following day. Similarly, more than 90 customers provided feedback about SculpSure on RealPatientRatings.com, who had given it an average rating of about 4.3 stars. 83% would recommend, with many of the same compliments and complaints found on RealSelf. While it sounds fancy, the term ‘lipolysis’ simply references the breakdown of fat into basic components like glycerol and free fatty acids. Although the body naturally does this to provide itself with the energy it needs to perform basic daily functions, there are many other non-invasive lipolysis treatments and systems competing with SculpSure. As we can see, most of these fall somewhere between $1,500 and $2,000 for a round of treatments. However, choosing which option is right for you might largely come down to the area of the body you’re looking to address. For example, although CoolSculpting is targeted at reducing fat in the belly, love handles, and thighs, it’s not meant to address double chin. On average, it’s also one of the most expensive procedures listed in the table above, and it’s one of the only ones to use cryolipolysis. On the other hand, Kybella is the only injectable option, but it’s FDA approved for just the double chin. Velashape was one of the least expensive options that also addresses the chin area, along with others like the arms, thighs, buttocks, flank, abdomen. Where does all of this leave you when it comes to SculpSure? Will SculpSure Deliver Meaningful Value for the Money? If you’re experiencing areas of fat accumulation that haven’t responded to diet and exercise, SculpSure seems like a competitively priced non-invasive alternative to traditional liposuction. It also comes with mostly positive online feedback, which could be a good indication of what you might achieve after undergoing a procedure of your own. And of the competing options above, it's one of the only ones that provide treatments for most of the body's problem areas, including under the chin. With this said, it’s always important to keep your expectations realistic with any liposuction procedure (traditional or otherwise) based on the guidance offered by your provider. Also, be to keep in mind that these procedures are intended only for trimming down otherwise difficult-to-lose areas—not for weight loss. Write a Review for SculpSure!